I wish I had taken some shots of the interior, but let me set the scene for you. Colandrea was founded in 1939. The three dining rooms are done in wood paneling. Waiters wearing burgundy jackets mill around making sure your water and bread basket are filled. There's reproduction Italian artwork and the walls are covered with Italianate oil paintings. In short it was like visiting my Great Aunt Ida (RIP). I actually got a little teary with nostalgia. 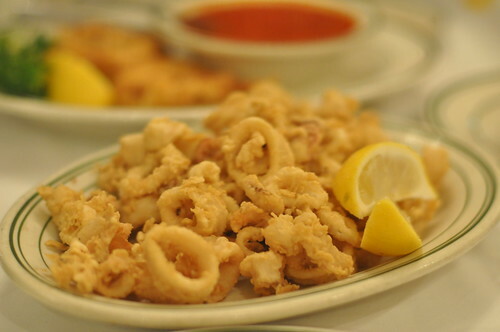 We started our meal with a half order of fried calamari ($9.75). Yes, that's a half order. Yes, the table next to us got a whole order. You'll want to have about 6 people to do the whole order justice and still have room for your meal. It was enormous. The half order wasn't shabby either. 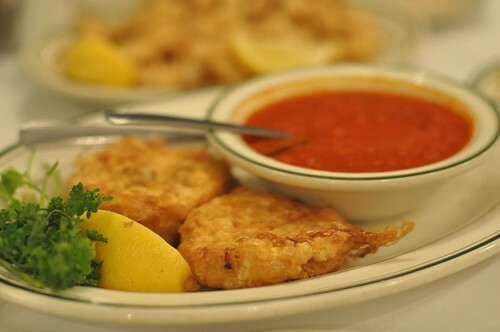 In addition to the fried calamari we got mozzarella en carrozza ($8.75), which is essentially a giant breaded square of mozzarella cheese with sauce. I told my husband to think of it as "cheese parmagiana," delicious! 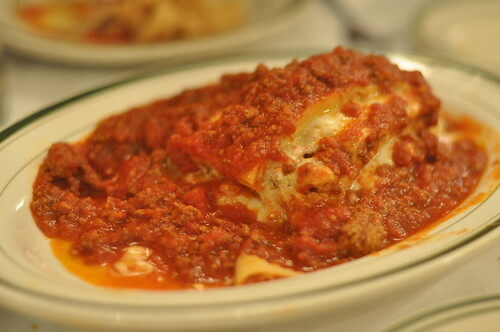 The lasagna ($11.00) was an impressive tower of meat, cheese and sauce. Lots of tasty, tasty red sauce. We also ordered a linguine with white clam sauce that the kitchen forgot to bring us. No matter, we were already stuffed. I can make mean Italian food in my own kitchen, but sometimes it's nice to have your meal prepared for you. For me the trip to Colandrea was like visiting my grandparents' generation. Now that my grandfather and his siblings have all passed, those are meals I can't ever get back. Colandrea dishes up solid cooking and generous portions tinged with memories. I'll definitely be back.